Convenience, premium products, wellness, nostalgia/comfort and global flavors are driving trends in the U.S. bakery industry, according to the San Francisco-based Center for Culinary Development and Packaged Facts. "Despite economic challenges, baked good sales have grown in the last few years," says CCD's CEO Kimberly Egan. "Consumers continue to connect with affordable baked goodness for the comfort it delivers, a comfort experience that now comes in many more varieties, shapes and sizes to meet everyone's needs." "Since the 2008 recession, we have seen a trend [of] consumers seeking out affordable indulgences," says Amy Clark, director of snack marketing for Hostess Brands (www.hostessbrands.com), Irving, Texas. "Recent trends in the restaurant industry, like gourmet mac & cheese and red velvet cupcakes, are trickling down into the grocery aisles. Consumers want to satisfy a craving for comfort food, so they want the ‘real thing' but in a smaller portion they won't feel guilty about." Major U.S. bakery companies include Hostess Brands (which just filed for bankruptcy protection) and Flowers Foods, plus the U.S. operations of Mexico's Grupo Bimbo. And there are some 2,800 smaller commercial bakeries with combined annual revenue of about $3 billion, according to Hoovers. The commercial side of the industry is concentrated: the 50 largest companies generate 75 percent of revenue. But the retail side is highly fragmented: the 50 largest companies account for only about 15 percent of revenue. But all are working to meet the conflicting issues of enjoyment versus the growing problem of obesity. "Obesity has been a major concern over the years, especially for the [edible] oils business," says Dilip Nakhasi, director of innovation at Bunge North America's (www.bungenorthamerica.com) Bradley, Ill., facility. Sales at in-store supermarket bakeries climbed through the first half of 2011, fueled by trends like smaller portion sizes, innovative donuts and pies and bake-off production, according to "What's in Store 2012," an annual trends publication from the Madison, Wis.-based International Dairy-Deli-Bakery Association. Mini-portion sizes of about two to four bites are a hot trend, as they retail at lower price points and typically carry less of a caloric impact compared to their full-size counterparts. Mini pies, cupcakes and cake pops are examples. The "free-from" trend is another idea escalating in in-store bakeries: foods free of gluten, nuts, allergens, trans fats and animal products are hot items, as are organic and non-GMO products. Fiber and whole grains are healthful additions to in-store selections. Shoppers want a wider array of sweet desserts, including intriguing gourmet donuts, crème puffs and sweet crepes. Donuts span the flavor spectrum, from novel to sophisticated. Wacky donuts, such as those topped with nostalgic treats such as Fruit Loops and Rice Krispie treats, are the kiddie counterpart to more sophisticated donuts, like those filled with fresh fruit preserves or gourmet chocolate. Pies are available in a plethora of shapes and sizes, including pie pops on sticks, upside-down pies, and pies baked in canning jars. Flavor is as vital as ever in the bakery. Sweet, hot, salty and tart combinations give consumers a double jolt of delectable dessert indulgence. For instance, baby back rib cupcakes combine sweet and savory in one decadent package. Sixteen percent of all grocery transactions included at least one bakery item. Roughly 12 percent of households bought more than one baked good, according to Perishables Group FreshFacts Shopper Insights. Singles are less likely to buy bakery products, which tend to be sold in multi-serving packages and can lose their freshness before one person can consume them. According to the report, white/Caucasian consumers make up 75 percent of bakery consumers in top stores. Hispanic consumers also have a strong shopping index for in-store bakeries and will have a growing influence on in-store bakeries. Couples with no children and older consumers are more likely than households with children to visit in-store bakeries. "In the early 90s, everyone said, ‘Let's get the fat out of products; make them fat-free and low-fat and we'll address it that way,' " he continues. "It didn't work because the industry didn't reduce the amount of calories, so consumers continued consuming the same number or even more than they did before. [At the same time] taste, texture and quality were badly impacted in baked goods, because if you take the fat out of the system, the product won't deliver the qualities we all look for." Nakhasi says fat has gotten a bad rap over the years, but actually it is an important component on our diet. "The challenge for us was to take out the bad fat, and add healthy fat without losing the taste and texture of the product. We had to go back and look at the chemistry to understand how standard triglycerides function and behave, and how we could substitute healthy fatty acids [and even] phytosterols, omega-3 and omega-6 fatty acids and CLAs [conjugated linoleic acids]. "We developed structured lipids, including essential fatty acids coming from canola oil, which have low saturates, more polys and more monos, and combined them with medium-chain triglycerides, which provide cardio health benefits and burn like carbohydrates. We combined them to get a process of interesterification or randomization, where we build the structured lipids." But how could this be dialed into a functional product for bakery? "We took the next leap in that direction by including in shortening beneficial phytosterols that reduce LDL cholesterol," he says. "With Phytobake, you can make muffins, biscuits, cakes, croissants, even pizza, while consuming a decent amount of phytosterols for your heart health. In 2010 IFT gave us an innovation award for Phytobake." Then there's the issue of mouthfeel in low-fat products. "A new normal may be just around the corner where product developers start with the goal of producing a delicious lower-calorie and healthier product, even though the product will not necessarily be labeled as low or reduced fat," says Janelle Litel, marketing director at Gum Technology Corp. (www.gumtech.com), Tucson, Ariz. "More products will be developed that have a rich, moist mouthfeel, but are still low in fat." Gum Technology, naturally, works mostly with gums to lend this mouthfeel to low-fat products. A key solution is Coyote Brand Fat Replacer, designed to reduce fat in a wide range of applications. "It can be used to replace up to 50 percent of butter, shortening or margarine in baked goods like cookies or cakes, while providing texture and adding fiber into the system," she says. "This translates into products with lower cholesterol and/or trans-fat content." But her company is exploring another route. "Gum Technology and Fiberstar Inc. (www.citir-fi.com) have combined their expertise and ingredients to develop a new generation of texturizers, called Hydro-Fi, that combine Coyote Brand hydrocolloids and Citri-Fi citrus fiber. One of the new texturizers, called Hydro-Fi CXA-0823, helps bind water to create a moist cake with great texture and mouthfeel. It also improves emulsification and can replace up to 50 percent of eggs in cakes." "We're seeing a couple of trends tied to what we're calling healthy indulgence," says Beth Peta, bakery marketing manager for Minneapolis-based Cargill/Horizon Milling (a joint venture of Cargill and CHS Inc.). "First, we're seeing continued interest in mini options, bite-sized cookies, brownies and muffins, which allows for customization and portion control. Also, we're seeing the addition of functional ingredients into bakery items to add the health benefits of dark chocolate, nuts, fiber, grains and fruit. Better nutritionals and added convenience are a must in both these trends." Cargill/Horizon Milling recently created two prototypes incorporating these trends. Whole Wheat Indulgent Snack Rolls are whole-wheat yeast dough rolled around a sticky sweet filling much like a jelly roll. The fillings can be fruits, such as apple or raisins, exotic spices or chocolate. It can be rolled in grains or seeds before baking to add interest and a crunchy texture. The key is WheatSelect white spring whole-wheat flour, a good source of fiber -- 3g per 50g (two pieces). "WheatSelect gives baked products more of the lighter color, softer texture and milder flavor of traditional wheat flour," she says, but with the nutritional advantages of whole wheat. Another prototype is a reduced fat, whole-grain muffin, which not only includes all of the benefits of whole grains but also has 33 percent less fat with 0g grams trans and no saturated fats. Plus, this prototype adds omega-3 fatty acids. "It exceeds consumer taste experience expectations," she says Peta. "It qualifies for the whole grain stamp and provides a good source of ALA omega-3." For the past several years, consumers have been soothing themselves with all manners of goodies from the bakery, ranging from freshly made pies and Parisian macaroons to decadent cookies and oozing lava cakes-all while enjoying new twists on old favorites as well as a more varied selection of baked goods and flavors. Despite recent economic difficulties, baked goods generally remain an affordable indulgence, and sales of bakery goods continue to grow pushed by a variety of drivers: convenience, premium ingredients, global flavor twists, wellness and nostalgia/comfort. In Baked Goods: Culinary Trend Mapping Report, Packaged Facts and the San Francisco-based Center for Culinary Development CCD use the CCD's signature Trend Mapping, guided by the premise that that major food trends pass through five distinct stages on their way to the mainstream technique. Seven sweet and savory bakery trends provide fresh ideas for manufacturers and restaurant operators to enliven stale offerings, spruce up the bread basket and add excitement to both the baking aisle and freezer case. The first two trends are in Stage 1. The Micropatisserie -- A newer, younger and hipper version of the traditional bakeshop, it offers a more select collection of baked goods made with artisan methods, gourmet or locally sourced ingredients, and a growing range of global flavors; and Alfajores -- A sweet South American treat with a familiar sandwich cookie form and gooey caramel filing that makes them readily appealing to the American audience. From Stage 2 to Stage 5, trends include: Popovers & GougÃ¨res -- Restaurants are placing a greater emphasis on the pre-meal traditional bread basket, adding everything from sophisticated French pastry puffs (gougÃ¨res) to traditional American popovers. These old-but-new savory bakery goods are already moving beyond restaurant chef innovations to gourmet retail, appearing in ready-to-bake form for those who want to upgrade the bread they serve at home; Specialty Frozen Desserts -- From French grocery stores specializing in frozen foods to Trader Joe's and other specialty retailers, frozen baked goods are available in more varieties and flavors than ever. A number of high-end pastry makers see a virtue to going frozen: it's convenient, keeps longer and it allows customers to participate in preparation, even if that's just sticking it in the microwave; Better Baking Mixes -- The days of basic-only baking mixes are over. As Americans cultivate more sophisticated palates, small companies with specialty tastes are putting out an increasing number of unconventional baking mixes with a widening range of concepts and ingredients; Pretzel-mania -- Pretzels are undergoing an upgrade, having been rediscovered by creative bakers and entrepreneurs-and even home cooks-for their unique texture and salty flavor. This twisted treat is showing up everywhere from fine dining restaurants and swanky bars to specialty shops, and it's taking on new and better forms: as a bar snack, sandwich roll, crusting agent and ingredients in sweets; Gone Gluten-Free -- A rapid expansion of gluten-free products- everything from pasta to breakfast cereal to pizza dough-has made it easier for consumers to try out this formerly niche dietary regime. While celiac disease sufferers must avoid all gluten, people with a host of other ailments are similarly giving up wheat to see if they are better off without. Now that the marketplace offers so many new selections, consumers can still have bread, pies, crackers and even doughnuts while they experiment their way to wellness. The formula uses MaizeWise whole-grain corn flour for 16g of whole grains in one 55g serving. CitriTex stabilizer blend is incorporated to reduce fat while maintaining the moistness and "springiness" consumers expect in a muffin. Clear Valley omega-3 oil is canola-flax oil blend that provides food manufacturers with a method to add alpha-linolenic acid (ALA) omega-3 to shelf stable products without affecting product taste, mouthfeel or shelf life. "There is a strong opportunity for better-for-you baked goods," says Rhonda Witwer, senior business development manager-nutrition at National Starch Food Innovation (www.foodinnovation.com), Bridgewater, N.J. "Consumers want to eat better and are trying to make better and healthier choices. They want great tasting products but they also want better nutrition and easier ways to stay healthy. Baked goods delivering functional ingredients, while maintaining great taste, will have a bright future." Witwer explains that for a significant portion of the population, traditional approaches to dieting don't work. "People can lose weight by reducing calories, but keeping it off is more seriou problem, so it may be that we're focusing on the wrong target," she says. "Yes, calories count, but some types of foods – like resistant starch – help by focusing on the underlying metabolic mechanisms. "The imbalance in insulin sensitivity causes further imbalances: higher than normal levels of insulin cause individuals to gain weight, which triggers additional insulin resistance, both of which lead to type 2 diabetes," she says. "Studies show that lowering insulin resistance can actually lead to easier weight loss. "Baked goods have been caught in the cross-hairs of this issue," says Witwer. "On one side, Atkins and other dieting programs advocate that processed baked goods should be controlled or minimized as part of a weight-control diet. On the other side, baked goods deliver resistant starch, dietary fiber and many other components of a healthy diet and are a strong comfort food for consumers." Corn Products/National Starch offers a broad range of soluble fibers, resistant starch, whole-grain corn flour and a unique mineral source that provides important benefits in weight, digestive, bone, joint, heart, glycemic and immune health. "Hi-maize resistant starch is particularly suited to bakery because it easily and invisibly replaces flour in baked goods while maintaining the taste and texture that consumers prefer," says Witwer. "There is published clinical evidence that that including Hi-maize resistant starch in a person's diet can improve their metabolic state. There is also published clinical evidence that [it] helps people stay fuller for longer and eat less, not only for 2-3 hours after eating, but because of its metabolic effects, people are less hungry the day after they have eaten foods with Hi-maize resistant starch." "More consumers believe that ‘helps maintain healthy blood sugar levels' is an extremely or very important labeling claim than believe ‘helps you feel fuller longer' is extremely or very important – especially so in individuals monitoring carbohydrate intake," she says. "Thus, there is a strong opportunity for baked goods that help maintain healthy blood sugar levels for not only glycemic control but also weight control and energy benefits. " And then there's the gluten-free market. Or markets. Packaged Facts forecasts gluten-free food sales will grow to $5.5 billion in retail sales by 2015. "The gluten-free category has grown from a rather niche market made up of those that require a gluten-free diet into a mainstream market, which now also includes people interested in gluten-free because of the perception that it is a healthier option," says Patrick O'Brien, National Starch's marketing manager for bakery. The Corn Products/National Starch portfolio includes three products that were developed specifically for gluten-free applications. Homecraft Create GF 10 and Homecraft Create GF 20 are specialty flour systems derived from rice and tapioca that that have functionality very similar to that of wheat flour. They serve as excellent bulk flours and enable commercial production of gluten-free baked goods with texture and product quality that closely resembles that of gluten containing products." The third is a texturizer. 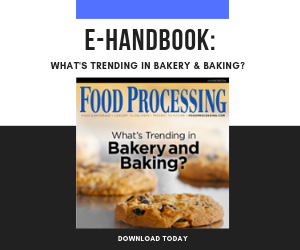 "Expandex modified tapioca starch enhances the appearance, texture and flavor of gluten-free bakery products, creates a moist and expanded crumb structure and can extend shelf life."